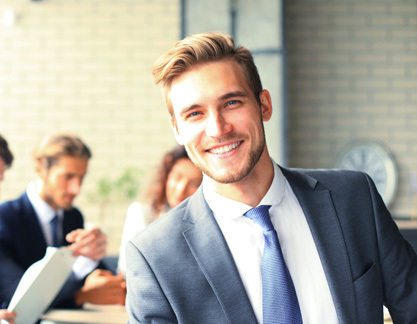 The Master's Degree program prepares students with the necessary skills and knowledge to understand, to manage, create a business and be able to assume leadership roles at the upper levels of management. The Master's Degree program prepares students with the necessary skills and knowledge to understand, to manage, create a business and be able to assume leadership roles at the upper levels of management. The program also provides the tools for business and leadership professionals to develop operational knowledge, communications skills, creativity, and judgment in all organizational environments. The MBA program has a deeper emphasis on theories, concepts and applications. This program is suitable for students who are interested in gaining advanced knowledge in business strategy and principles, preparing them to work in business and academic professions. This degree also covers advanced topics in allied subjects such as e-business, project management, risk management, strategic planning and implementation and operations management. Students will clearly show the existence of actively conceptualizing, applying, evaluating the information gathered to various aspects of business challenges by showing dependable and well-thought perspectives that drive change. Students will clearly show the existence of understanding how businesses use digital technology to succeed and how to use the same technology to solve business challenges. Students will be able to demonstrate effective and practical communication to business situations, generate professional business documents, effectively collaborate in a team environment, and prepare and deliver effective oral presentations. Students will be able to apply critical thinking, technology and analytical and communication skills to business situations and formulate business strategies while effectively managing expected outcomes. At AHUSC, we know that the high cost of tuition at traditional colleges and universities are not within the financial range of many prospective students. The statistics show that for the majority of working adults and professionals campus based programs are not the answer. We are committed to offering very affordable tuition to fit your needs and your budget. The cost for the Master of Business Administration (MBA) is $250.00 per unit. For list of all additional fees, please click here. Staying current with productivity technology is an important part of your education and an important component of our method of instruction. To ensure your success in our programs, you will need access to and use of the hardware and software listed below. You must also have the technical skills outlined in the Academic Catalog. A high-speed internet connection with a connection speed of 1.5 MB/s or better. Students are required to have reliable access to a PC or Mac but may use a mobile device such as a phone or tablet as a secondary means of access with our Populiweb (Learning Software System). This app is available for iOS and Android users. Please keep in mind that access to website functionality and required course materials may be limited on mobile devices. A management consultant's job is to advise companies on their management practices and identify problems within the organization that may be holding the company back from reaching their goals. Many management consultants are self-employed, while others work for large firms. According to the Institute of Management Consultants, about 27% of consultants are self-employed. This is an ideal arrangement for many MBAs: a flexible career path with high earning potential. Marketing managers oversee the planning and execution of a multifaceted marketing plan to help their companies grow. They set budgets, plan marketing campaigns, and manage staff on the marketing team to conduct market research, launch marketing campaigns, and analyze the data collected from each campaign to make improvements. Their goal is to create more brand awareness and bring in sales. Marketing managers must be knowledgeable about many different types of marketing approaches and also be skilled at leading a diverse team. Investment bankers help companies invest and grow their capital through shrewd purchasing of equity and debt. They also provide advice and assistance during financial transitions such as acquisitions and mergers. Bankers are responsible for ensuring all pertinent paperwork is in order and that all government regulations are followed during any and all transactions. An operations manager is sort of a company's jack-of-all-trades. He or she oversees daily operations, purchasing, inventory, coordination between departments, and policy creation. Responsibilities may also include hiring employees and negotiating contracts. However, this job will vary depending on the organization and expectations of the CEO. Therefore, this position requires a great deal of flexibility and multitasking. Financial advisors cater to the individual rather than businesses, and play a key role in helping families plan for retirement, invest in their children's education, and build individual wealth. A financial advisor looks out for their clients' best interests by suggesting good investment opportunities and creating realistic long-term plans. This is an excellent career path for MBAs who have a desire to help others become financially savvy.